It was a “total triumph,” remarked Farmington School Board member Angie Hahn as she was leaving the auditorium. What she was describing was the dedication event for a new piano at the Centene Center on March 20, 2016. A large crowd had turned out to see an array of performers –which included a jazz combo, dancers, and some of the area's leading pianists-- all of whom were on hand to celebrate the arrival of a permanent new star for the Centene Center's large stage: a handsome grand piano. Planning for the auspicious occasion had began a year earlier when retired Farmington High School band director Curt Bauche learned that the Center was not able to bring a number of important programs to the facility’s stage because it lacked a piano. Renting one was simply too expensive and troublesome for many would-be musical events at Centene. 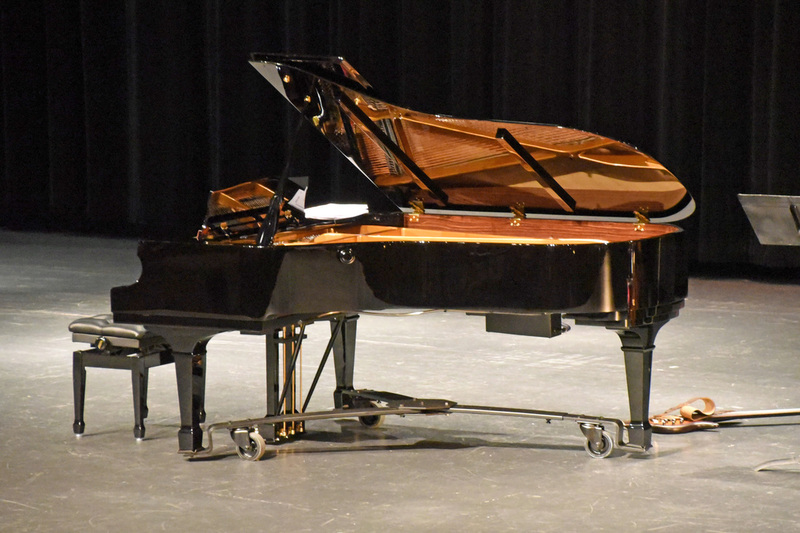 Determined to solve this problem, Bauche began a campaign –with the support of the Farmington City Council-- to raise funds for a piano that would do justice to the otherwise splendid auditorium located next to the Community Center just across from Farmington High School. As Bauche told the crowd at the ceremony, local support for the purchase of a grand piano was “amazing.” Indeed, he added that most of the expense for the "Grand Piano Project" was committed within the first 17 days. But before any piano and other necessary accessories could be purchased, much preliminary work was necessary. This included studies to determine which kind of piano would be best suited for the various types of events normally held in the Center's auditorium. Once all the pieces had fallen into place a year later, an enthusiastic crowd gathered to hear the results of all the hard work that made this event possible. No one was disappointed, as those in attendance applauded each of the musical selections on a program by prominent local musicians that included everything from classical works such as the four-hand duet Rondo in F major by J. S. Bach to a simple version of Chop Sticks. The selection of music presented that afternoon demonstrated the versatility of the grand. Following opening remarks by Mayor Mit Landrum and Bauche, the first act took to the stage: the Choraliers -- a talented high school singing dance group who performed, appropriately enough, a number centered around Irving Berlin's popular ditty, I Love a Piano. Then, for the first time, the grand piano itself was moved into view of the appreciative audience. Mineral Area College Music Chairperson Dr. Kevin White got things off to a rousing start as part of a jazz trio that included North County High School sophomore Josh Newberry and MAC music major Alec Ramsey who offered two high voltage selections, Great Balls of Fire and Johnny B. Good.